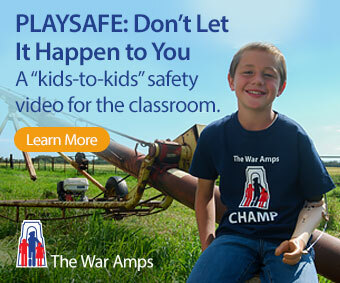 In this article, we are featuring someone and something a little different. Yvonne Cattrall is and likely will always be a teacher, but her classroom is a swimming pool and her students run the gamut in ability and age. Originally a competitive swimmer, Yvonne went on to become a well-respected swimming instructor and coach. 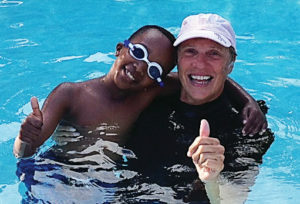 Over her many years of teaching Yvonne estimates that she has taught some 28,000 swimmers. Finally, after 49 years of teaching and competing, as well as managing her own business, Yvonne decided to retire. Although she kept her treasured six World Title medals, she gave each student in her last class one of the many medals she’d won over the years as a memento and also to show that you can live a full life doing what you enjoy. Having been a competitive swimmer in England from 11 years of age, I had an advantage when it came time for me to take my life-saving awards. I was successful in passing my Bronze Medallion and Award of Merit with Royal Life Saving Society in my early teens. At that time, the sole goal of attaining those awards was to prepare to become a lifeguard at our local pool. I spent all of my spare time at pools anyway, so the idea of working part-time and being able to hop into the pool and train before or after work, plus make some money at the same time, seemed like a dream. One day, when I was 16 years old, after my workout (and before becoming a lifeguard) I was about to leave the pool when an elderly lady approached me on the deck and asked me if I could teach her how to swim. Without thinking I said “yes” and so I did, right there and then. She went from being a total non-swimmer to being able to swim 12 front-crawl strokes across the pool. It took half an hour. The lady was ecstatic and it proved to be a productive and personally rewarding way for me to wait for my ride home. I do not remember the lady’s name though I do remember that she was 84 years old. This success excited me—I felt so proud— and I even thought that perhaps someday I could become a swimming instructor or swim coach. A couple of years later I qualified as a swim instructor both at the standard and advanced levels and was offered a job working for the London Borough of Merton Schools, as swimming was and still is part of the school curriculum in the UK. My particular job was as part of a team that taught large groups of students ages, 6 to 11 years. Sometimes there were classes of 30 to 40 swimmers and I absolutely loved it. In addition to my teaching job, I took over the head coaching position at our local girls’ swim club. I loved what I did so I was sorry to leave both positions in May of 1970 when my husband and I moved to Toronto. Did you work outside of Canada or in another field? Yes I did. For a short time I worked in London at a stockbroker’s and because teaching swimming was not part of the school curriculum in Toronto, as a dental assistant when we lived there. Also, five months after I retired, my husband and I went on an independent twelve month trip around the world. On our way back to our new home in BC we stopped off for a month in Toronto to visit family and friends and I taught lessons for four weeks—my busiest month of summer lessons ever! Right now, in the early years of retirement, there aren’t enough hours in the day to do everything I’d like to do. My husband and I are still travelling extensively while we’re well enough to do it the way we like to. As well, I am training again to compete in the World Masters Games in Auckland, NZ in April 2017 and I will combine another trip somewhere with an international swim meet. Most years during my teaching career in both London and Canada I did volunteer work weekly with Down’s syndrome, autistic and physically disabled children. Sometime in the future I may teach swimming and volunteer again, but for now I am fully occupied with simply settling into our new community and home. Do you have any advice for people thinking about retirement? I would absolutely advise people to travel when they retire if they possibly can. I think travel broadens the mind, promotes understanding and compassion between cultures and people, and to me the money is well spent as a way to keep challenging yourself. As well, I think travel reinforces how fortunate we are to be living in Canada. Yvonne’s classroom may have been a swimming pool but teaching is the same in any classroom, and like all educators she never stopped learning. At the moment she’s expanding her own horizons through travel, but it’s likely that she’ll start teaching again, whether it is some of her new neighbours who have requested that she consider it, or one of the special needs groups she’s worked with in the past. The simple lesson to be learned from Yvonne’s story is that when you retire, keep fit in mind and body and challenge yourself to keep life interesting. This is a lesson well worth taking into consideration as you contemplate your own special retirement journey. Carol and Enise (info@drassociates.ca) are the creators of a series of pre-retirement and post-retirement planning workshops: Transition to Retirement: The Uncharted Course©, Recently Retired: Charting a New Course© and Ideas… Enhanced and Advanced©, and authors of Transition to Retirement: The Uncharted Course. Previous articles on retirement may be viewed in back issues at CanadianTeacherMagazine.com or by clicking HERE. 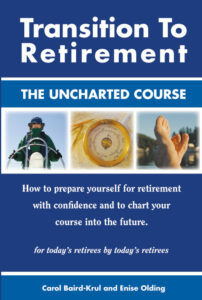 Transition to Retirement: The Uncharted Course reveals what there is to learn about that crucial transitional phase from when you leave your job to when you feel significantly engaged in the life of retirement. It is not about finances or lifestyle; it is about you—the person behind the work title, nametag or job description and how to discover who you are or will be outside of your job. A must-read for anyone thinking about retirement or who is recently retired. This article is from Canadian Teacher Magazine’s Apr/May 2016 issue.